Part of the appeal of Laika's stable of films is their fantastic hand-made aesthetics. 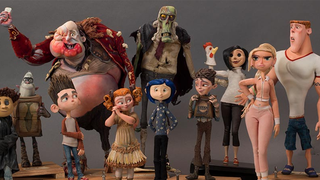 They're all stylistically interesting, but the commitment to traditional stop-motion animation is what makes them so great - and also means that next month you could own a little bit of Coraline, Paranorman or Boxtrolls! Heritage Auctions will be selling off various production puppets, props and art from Laika's movies, 250 in total, from February 12th - but if you don't think you'll be able to afford to bid on an item, they'll be exhibited at various Heritage Auction sites in the run up to the auction itself so you can see them in person. There's a lot of cool stuff in there - hero puppets of both Norman and Coraline, and even Snatcher's drill from Boxtrolls, the biggest prop ever built for a stop-motion film. That's pretty swish! Portions of the profits made from the auction will go to a good cause, too: The Art of Elysium (no, not the Neill Blomkamp movie), a non-profit that uses art to inspire and better kids and other people in need. Check out a few more pictures of some of the stuff going on sale at the links below.